Today is one of the more substantial days in terms of Minecraft, as the “Halo" mash-up pack is released on Xbox 360 edition of Minecraft. Users can relax in their creative Minecraft worlds while still enjoying the magnificence that is Halo with this new mash-up pack. As well as this however, a new patch is being rolled out today for the PS3 edition of Minecraft. This is good news to Minecraft players on either consoles as they have something to look forward to for today. First of all, the awaited Halo mash-up pack for the 360. Players have been looking forward to this since it has been announced (as well as constantly tweeted about on the 4J Studios Twitter). 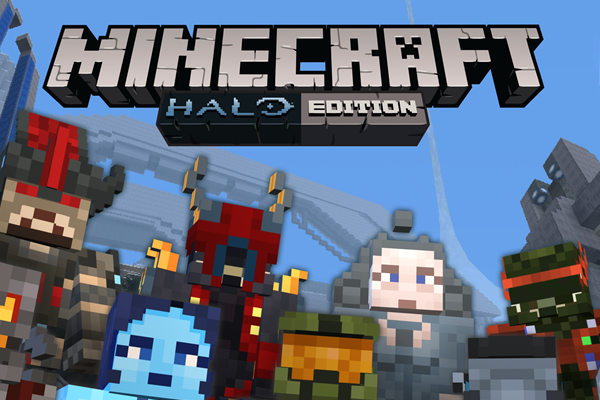 Players can look forward to reliving some of the older Halo, Minecraft style, as the mash-up pack brings plenty to the table for everyone to enjoy. In the mash-up pack, players will be able to take full advantage of the Halo themed texture set, as well as themed menus and user interface. There will be 31 Halo themed music tracks to choose from, as well as, and perhaps most importantly, 40 new Halo themed character skins! There truly is nothing quite as incredible as killing creepers while skinned up as Cortana or SGT. Johnson! 4J studios have also confirmed that by purchasing the mash up pack on 360, you will own it on the Xbox One version of Minecraft. Images can be seen there. - More voice chat fixes. The pack will be available for $3.99/€3.79/£2.69. A great day for Minecraft all around, personally, I am very intrigued by this Halo pack, as I feel it will be both nostalgic and very interesting. This could be the first expansion I purchase for the 360 edition of Minecraft. How do you feel about this new pack? Would it be something you might buy?